Note that this page is a preliminary student design and has not been vetted. Care should be taken to read critically and weigh the evidence. too much materials in non-stress points -- not enough in others. This page is dedicated to the design and development of an open-source Hands-Free Crutch for the developing world. All components are designed with open-source software. OpenSCAD, FreeCAD and/or Blender have been utilized for digital file generation (STL). All components have been printed on a MOST - Athena Delta Printer. 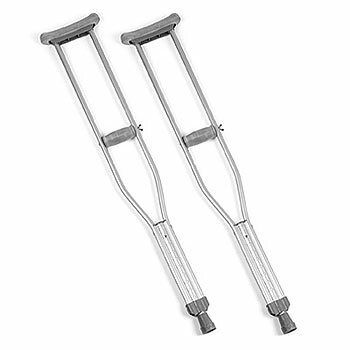 Standard crutches are produced between $10.00 and $120 ref. This Open Source Appropriate Technology (OSAT) aims to decrease the overall cost of a standard crutch and to enter the specialized market. This provides a 3D printed alternative by simultaneously allowing for customization based upon a user / patient's condition and size (height, weight, leg size, etc...). 1x C-Clamp Filename: 'C clamp.stl"
The significant design considerations that allow this part(s) to be printed with minimal support have already been accounted for in the provided files. Thus, any 3D printing operator with sufficient machine (~>3 months) experience should be able to successfully print these parts without trouble. Print all printable parts from Bill of Materials. Printing time will be approximately 71 hours 58 mins. Insert the tongue on the leg rest (Front-Knee) into the groove of the leg rest (Rear-Ankle). Press firmly until the internal faces of the two parts are flush. Insert M6 Bolt into the hole of the leg rest (Rear-Ankle). Thread into M6 nut. Tighten with Alan Wrench until tight. Repeat on opposite side. Thread 40mm Threaded Knee Rest Rods into the threaded holes on leg-rest(Front-Knee). Continue to tighten until resistance is felt. Thread 38mm Threaded Knee Rest Height Adjustment onto 40mm Threaded Knee Rest Rod. Adjust to desired height. Slide Knee Rest onto 38mm Threaded Knee Rest Height Adjustment. Thread Threaded Bottom Foot onto 58mm Female Threaded Height Adjustment. Tighten until tension is felt. Thread assembled 58mm Female-Threaded Height Adjustment onto 60mm Threaded Rod Support. Adjust to desired height. Assemble Secondary Support Rods with C-Clamp and 90mm M6 as shown in part gallery. Slide C-Clamp onto assembled 58mm Female-Threaded Height Adjustment. Tighten M6 nut on C-clamp until tensioned around 58mm Female-Threaded Height Adjustment, until tension is felt. Assembly time will take approximately 10 minutes. Ensure you do not apply excess force in tightening the bolts. These should tighten just until strain is felt on the wrench, no further. If threads do not fit correctly, an x-acto blade can be used to clean up any defects that are visible. Otherwise, the provided OpenSCAD includes parameter "tolerance", which can be increased or decreased s needed. Page was last modified 04:36, 16 December 2016. Based on work by Joshua M. Pearce, Shan Zhong, Kathrine Cipriano and John J. Laureto, Appropedia user Snuchitp and others.